As we head into Week 11, it’s time again to look at our top IDP streaming options for fantasy football. It’s another brutal week awaits as six more teams have their byes in Week 11. Couple that with the inevitable injuries that keep piling up and it makes the waiver wire, especially on the IDP side, especially thin. But fret not as there are still solid streamers out there. Before that, however, let’s take a look at last week’s picks. There were a few hits, including Eagles lineman Michael Bennett recording two sacks after getting to the quarterback four times. Minkah Fitzpatrick did have a pass defensed to go along with his couple of tackles. Outside of that, our recommendations didn’t have any real big plays, just solid tackle numbers. We’ll turn it around this week with the streamers below. Because Jarrett is classified as a defensive tackle, his ownership numbers will be low, but that designation is exactly the reason I like him as a streamer. Typically, defensive tackles are awarded more fantasy points per tackle over ends, which is good for Jarrett, as he has at least three tackles in each game this season and at least five in half of them. He should have no problem adding to those numbers as he faces a Cowboys team that runs the ball 27 times per game, primarily up the gut with running back Ezekiel Elliott. But there’s a decent chance Jarrett tallies a sack too. He has three sacks in his last three games and has the 15th-best pass-rush productivity rating among all interior linemen. He now goes up against a Cowboys team that currently ranks tied for worst with 3.6 sacks allowed per game, including giving up 13 in their last three. Both Payne and Allen have taken a back seat to Matt Ioannidis and his 7.5 sacks this season, but they have seven between them and draw a favorable matchup this week against the Texans. For starters, Allen and Payne are the top two Redskins linemen when it comes to pass rushes on the season — Payne with 275 and Allen with 281, about 30 per game apiece. Houston, despite ranking just 26th with 31.8 pass attempts per game, give up the second-most sacks per game with 3.5, including four more last week. It probably has something to do with their 25th-ranked PFF pass blocking grade, which, sadly, is still a better finish than their run-blocking, which is ranked second-to-last yet third in the league in attempts per game. So whether it’s the run or pass, Allen and Payne will both have plenty of opportunity to rack up the fantasy points. Between suspensions and injuries, the Bengals linebacking corps has been a revolving door of players. Not one has played more than 400 snaps, but all that just means more opportunity for players like Evans, a sixth-round pick from 2017. Evans has seen his two biggest games when it comes to snaps the last two weeks and has totaled 20 tackles, 1.5 sacks and a pick in that span. 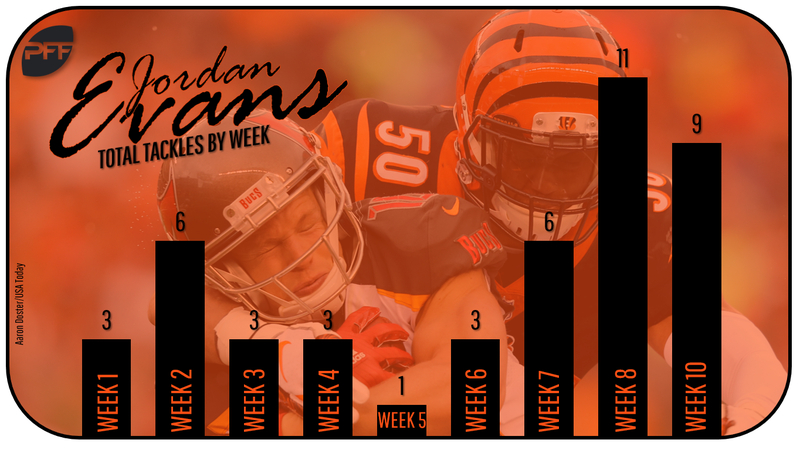 Evans will have a good chance to add to those totals this week as Bengals linebacker Preston Brown is now banged up, alongside fellow injured Bengal linebackers Vontaze Burfict and Nick Vigil. It also helps that the Bengals travel to the Ravens and their league-leading 71 plays per game, meaning plenty of chance for more tackles. Anzalone doesn’t play nearly as many snaps that fellow Saints linebacker Demario Davis, yet he’s been nearly as productive, at least in the last three games. Despite Davis playing more than double the snaps, he has just three more tackles than Anzalone does (18 for Davis, 15 for Anzalone) in that span. Efficiency is a theme for Anzalone who has recorded at least four tackles in every game he’s played at least 27 snaps this season and five in his last three. He should build on that streak while seeing even more snaps this week when the Saints play the Eagles. Philadelphia runs 67.1 plays per game, good for fifth in the league, while giving up 13 tackles to linebackers in two of their last three games. Landon Collins is typically the Giants defensive back garnering fantasy attention, but Riley can hold his own and his opponent this week makes him a great streaming option. On the season, his total of 45 tackles is third on the team, behind only Collins and linebacker Alec Ogletree, while playing the second-most snaps on the defense. He’s also had at least five tackles or a pass defensed in every game this season. Not bad for a player with 12 career tackles before this season over two seasons in Tennessee. The Giants now play the Buccaneers in Week 11, which is great news for Riley’s fantasy prospects. Tampa runs the second-most offensive plays (68.3) in the league, a good sign for Riley’s tackle numbers. And even though Riley’s only seen 11 targets in 300-plus coverage snaps this season, Tampa passes the second-most times per game (41.6) and has given up 15 passes defensed over the last two games, increasing the chances Riley is involved. Being classified as a cornerback, Fuller may not be as highly owned in IDP leagues but this week makes a fine play as he and the Bears host the Vikings. For starters, Fullers been an every-down corner this season literally missing only a handful of snaps. He’s been PFF’s fourth-highest-graded corner this season with his good play resulting in 11 passes defensed, tied for fourth-best in the league, and four picks, which is tied for second-best. He’ll square off against Vikings quarterback Kirk Cousins who, while only throwing five picks this season, does lead the league in batted passes with 15. Minnesota as a team is also fifth in the league with 40.3 pass attempts-per-game. All of this to say there should be plenty of chances for Fuller to add to his already good fantasy stats.